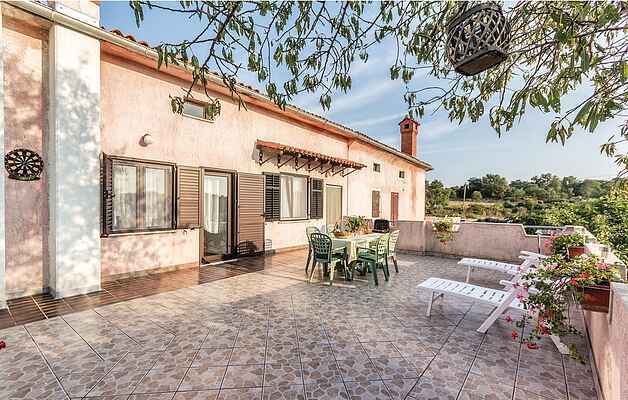 This functionally furnished holiday apartment is located on the first floor of a family house and has a bathroom, kitchen with dining area and two bedrooms. Bedroom no. 1 is a go through room from which you enter into the bedroom no. 2. Relax on the spacious terrace with view on the natural landscape while sunbathing or playing darts. At warm summer evenings you can prepare delicious barbecue meals and at nights watch the gorgeous starry sky. On the neighboring plot livestock are kept and vegetables are grown, which you can taste according to the season.